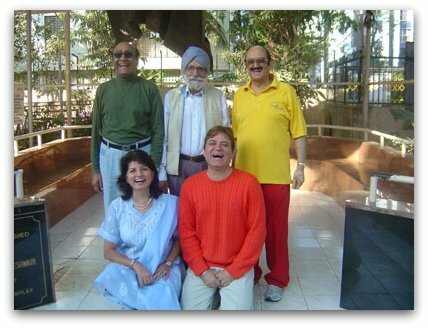 Beginning in March of 1995 in a Mumbai park; Dr. Madan Kataria assembled a group for the purpose of gaining the benefits of laughter for increased health. This took the form of relating jokes to one another. The number of participants dramatically increased within a few days. Eventually the stock of good jokes became depleted. The decision to discard joke telling altogether, allowed a deeper, more direct experience to occur. Breathing and stretching exercises introduced by Dr. Katarias wife Madhuri, created a system for stimulating health, through laughter without dependance on humour. Laughter Clubs quickly formed throughout India. 'Laughter Yoga' is the name given to this practice of developing health through laughter exercise. Laughter Clubs are regarded as 'the heart and soul' of the international network of laughter yoga practitioners. Anyone can start their own Laughter Club. Special permission is not required. Many who have certification as 'Laughter Leader' are happy to assist those who want to form a Club. Certification courses are available to those interested in joining a growing community of Laughter Leaders and Teachers registered with the Laughter Yoga International Organisation. check www.laughteryoga.org for Clubs worldwide.